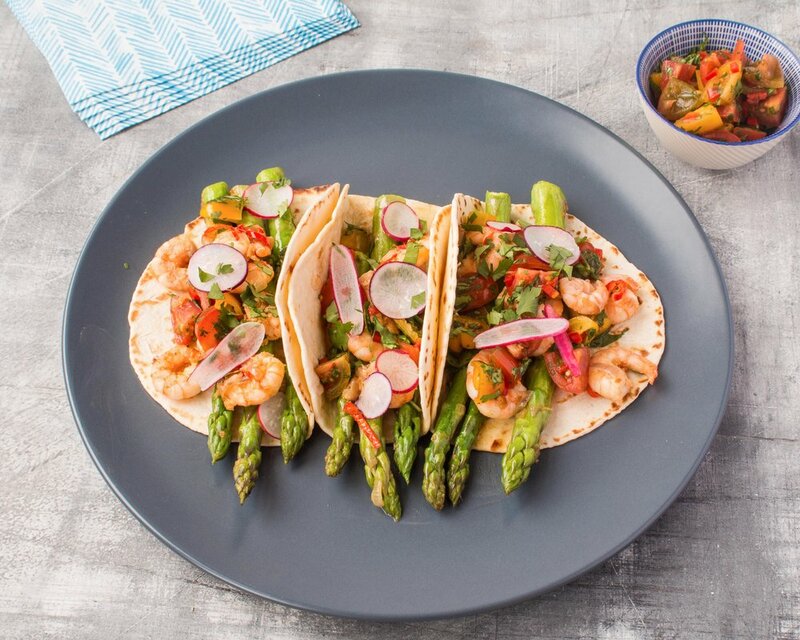 For a quick 30-minute meal, load these tacos with pan fried garlicky prawns, asparagus, fiery tomato salsa and fresh coriander and radish. Roughly chop the tomatoes and place into a small bowl. Finely slice 1 chilli and half the coriander and add to the tomatoes with the zest and juice of 1 lime and a drizzle of olive oil. Stir well, season with salt and pepper and set aside to allow the flavours to develop. Meanwhile, finely chop the shallots and remaining chilli and crush the 2 garlic cloves. Place a medium sized frying pan on the heat and melt the butter. Once hot, add in the shallots, garlic and chilli and fry until softened. Add the prawns and cook until pink all over. Once the prawns are cooked, remove from the pan and set aside. Add the asparagus into the same pan and pan fry for 3-4 minutes. While the asparagus is cooking, heat up the wraps either in the microwave or a dry frying pan. Once everything is ready, assemble the tacos, first with the asparagus then the prawns and tomato salsa. Top with the remaining coriander leaves and finely sliced radishes. The perfect alternative to a Sunday roast for Spring time. Just 5 ingredients, this has little preparation time and will seriously deliver on flavour. Place a medium pan of water onto boil while you chop your potatoes into 3-4cm chunks. Add the potatoes to boiling water and cook for 10 minutes, then drain. Place a large frying pan on the heat and add a drizzle of olive oil. Once the oil is hot, add the lamb chops and sear on all sides until browned. Place the potatoes into a medium sized oven tray and nestle the lamb chops in amongst them. Add the rosemary, asparagus spears and peas and roast in the oven for 10 minutes until the asparagus is cooked and the potatoes are crispy. This is the perfect summer side dish. Leave out the burrata if you are after a delicious vegan option. Place the garlic, red wine vinegar, anchovies, parsley, basil, lemon zest, capers and olive oil into a hand-held blender and blitz until combined but still coarse. Check the seasoning and add salt and pepper if needed. Chop the echalions lengthways, into four quarters and drizzle with a little olive oil. Place in a smoking hot griddle pan to cook until they are soft and slightly charred but still hold their shape. Set aside. Cut the woody ends off the asparagus and lightly oil them, then place in the griddle pan for 2-3 minutes until charred but still tender. 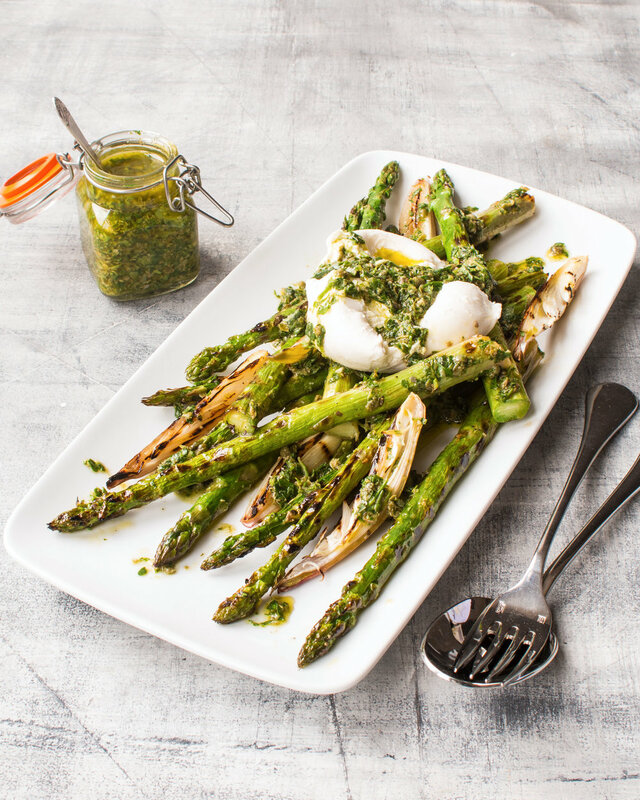 Arrange the asparagus and echalions on a plate, top with burrata before spooning over the salsa verde.